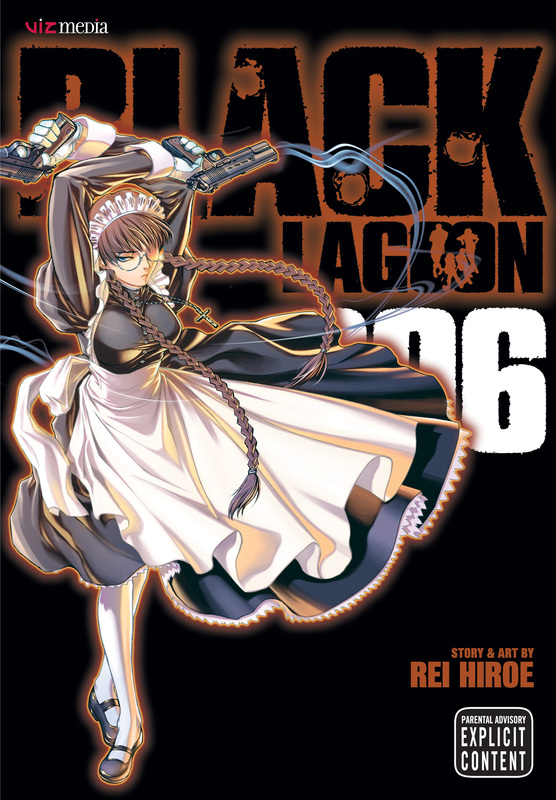 Black Lagoon volume 6 was illustrated be Reu Hiroe and was published on the 11th of November, 2006. This volume features the next nine chapters in the series (38-46), read the review for the fifth volume here. After their recent escapades in Japan, the gang has decided to kick back for a bit back home in Ruanapur. However, their break ends abruptly when a counterfeiter called Jane shows up on the doorstep of the Church of Violence, with a Florida-based gang hot on her heels. This starts a manhunt with many of the more unique gunmen of Roahapur. Then, a bomb explosion kills Roberta’s employer, Diego Lovelace, and her young master is left without any family. Roberta swears vengeance and heads up the war path, travelling to Roanapur the “Bloodhound of Florencia” stirs up hell. and sends everyone into a state of emergency. My Review: This volume starts off with a nice little story, we meet a new character who’s in the business of money forgery, which up to this point hasn’t really been explored in Black Lagoon. We also get to see Shenhua make a return, although this time she’s working against the crew. Then we move on to the longest arc in the entire series, and I’ve got a good feeling about this one. It starts off with a big boom, literally, and then the aforementioned Roberta snaps. During this period she gives this monologue to her young master, I found the imagery and flashback during this point were actually some of the best in the series, the way we see her cute demeanour shift in turn with the panels of the wild dog really bring home the effect this even has on her. However, it is very clear that this is just the start of something big. I rate this manga 2.5/5. Wow,just to add that the “Greenback Jane” arc has a hilarious scene: Where Eda actually belongs to the CIA,a scene hidden from the Lagoon crew>Eda swiftly kills off Russell,the only one who knew this secret,but foolishly being such vocal.What a twist,that paves the way to wonder about how much long the CIA is being there,and about how fooled Hotel Moscow as well.